Quebrado is a slave on a pirate ship, named "the broken one" for being the son of a native islander and a Spanish army deserter. He has worked on ships on the Caribbean Sea for his entire life, and made himself useful because he can speak the native language of Taíno and also Spanish. When his ship is destroyed in a hurricane, he washes up on Cuba, along with pirate captain Bernardino de Talavera and brutal conquistador Alonso de Ojeda. Suddenly, Quebrado has the power and is able to decide the fate of the two men who have imprisoned him and countless other Indians. 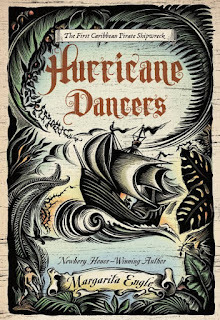 I will read anything Margarita Engle writes, so was eager to check out Hurricane Dancers. 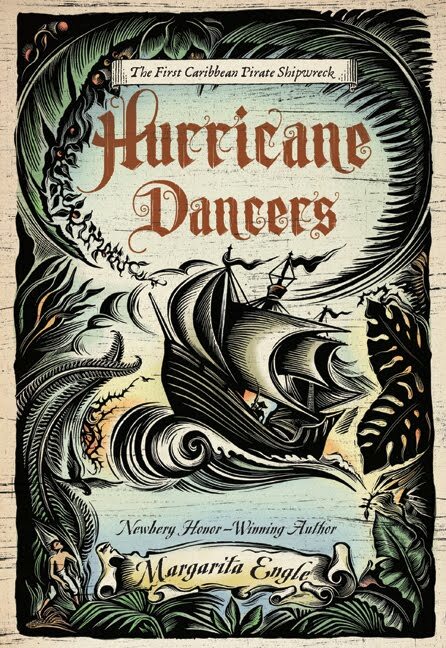 Although it won the 2012 Pura Belpré Award, I did not love Hurricane Dancers as much as Engle's other works. In addition to poems from the perspective of Quebrado, Bernardino de Talavera, and Alonso de Ojeda, it also features the poems of young Cuban lovers Narido and Caucubu. The multitude of narrators dilutes the story; I wanted to learn more about all of them, so felt unfulfilled at the end of the book. The story of star-crossed lovers Narido and Caucubu would have been better as its own book, possibly a sequel where Quebrado makes a guest appearance. or deep water and sharks. When I sleep, I belong to the land. planting roots in rich soil. riding my father's leaping horse. Hurricane Dancers would have been a fantastic accompaniment to my class' study of Shakespeare's The Tempest. I wish I had read it a few weeks ago! I admire Engle's commitment to exploring her Cuban heritage and sharing it with young readers. I felt the same way, this one just didn't live up to her others. I like your idea of a whole book on Narido and Caucubu. I would read that!